Check out their site for more cute photos. Halloween is coming soon! Don’t forget to keep your pet safe during this fun event. Safety includes keeping candy, especially chocolate, out of the way of your pet, keeping candles and other decor out of the way of wagging tails, and making sure pet costumes are not hurting your pet or restricting their breathing. For more great pet Halloween tips visit http://www.examiner.com/x-2786-SF-Dogs-Examiner~y2009m10d28-Dog-safety-for-Halloween-night. For other safety tips to consider for your dog this Halloween, visit http://www2.staffordcountysun.com/scs/lifestyles/pets/article/pets_dogs_goblins_not_always_a_good_mix/46136/. Puppies are so darned cute! But don’t be fooled, they are also a lot of work. If you choose to adopt a puppy rather than an adult dog, just keep in mind all the extra work which you will need to do in order to make this puppy a great dog. The first few nights will be the hardest because the puppy is most likely going to cry. You are going to want to bring the puppy to bed with you in order to comfort them, but this could end up turning into a bad habit. It is best if you keep your puppy in a correctly sized crate overnight and when you are not home. You will probably suffer a few sleepless nights, but your puppy will get used to it and you will soon be sleeping soundly again. Training your puppy to be in a crate can also help with house training and with helping to prevent out-of-control chewing. After crate training comes house training and obedience training. Dog training takes time, persistence, consistency, and love. If you have never trained a dog before, we highly recommend a dog training class. Dog trainers don’t train your dog for you, but they do help you learn how to train you dog which will be best for both you and your dog. Another form of training is called socialization. This is very important for puppies. By taking them out to meet people, other dogs, and to see and sniff out all sorts of objects, you will help them be better and happier dogs. Lack of socialization can result in your dog being scared or aggressive towards people, children, or other dogs. Lack of socialization can also result in your dog being scared or aggressive towards certain things like kids on bicycles or skateboards, household items like vacuum cleaners, cars, or anything else which makes a loud or strange sound. Besides training, there are also lots of expenses involved in getting a puppy. You need to get your puppy fixed and you need to take them to the vet for their exam and for their shots. You will also want to get your puppy heart guard medicine and flea prevention. Your puppy may also require a special food diet. Then there is the chewing phase to get through with your puppy. The chewing phase can last until the puppy is about two years old, sometimes longer if the puppy isn’t properly trained. And don’t forget that your puppy is going to need lots of attention and lots of exercise. So if you have a busy life, you may want to consider adopting an adult dog instead. Don’t be taken in by those cute puppy faces unless you are ready for the extra work and expense which goes into raising one. There are a lot of homeless dogs out there, and some of them are homeless because the previous owner’s were not prepared for what goes into raising a puppy. A Boxer dog can make a great pet, but they can also take a lot of work. Before getting a Boxer dog, click HERE to read some great information. If you live in the Annapolis, Maryland area, help this man get his dog back. Army Sgt. Ben Terfehr had his jeep stolen Wednesday evening from a local gas station. Unfortunately, his 8-month-old German Shorthaired Pointer, Ellie, was in the vehicle at the time. The sergeant isn’t concerned about the jeep, but he wants his dog back. If anyone knows anthing, please contact the police. To get more information on this story, visit http://www.wbaltv.com/news/21406833/detail.html. For more pet auto safety tips, visit www.PetAutoSafetyBlog.com. Here is a fun game to play with your dog. Let your dog watch you put a treat in one of your hands. Close both of your hands in a fist and put your hands behind your back. Switch the treats around, then place your closed hands in front of you and ask your dog, “Which one?”. Your dog will probably sniff your hands for the treat, but try to get them to touch one of your hands with their paw, as in the “shake” command. If your dog chooses the wrong hand, open your hand and let your dog investigate. Then close your hand and ask, “Which one?” again. Surprisingly, when I first taught my dogs this, they would choose the same hand over and over again. But after some practice, they figured out that if it wasn’t in one hand, it would be in the other and they would choose each hand until they found the treat. Once they get it down, then make it more challenging by getting more people involved. Using only one treat between two or more people, put four or more hands in front of your dog and ask, “Which One?”. My dogs love this game, although my hands do get a little scratched up because of their toenails. Cassie was a Shetland Sheepdog and my childhood pet/best friend. She was super intelligent and loved me very much. As a child, I wasn’t always the best dog owner in the world, but she was the best dog. She put up with everything I did to her from making her wear silly costumes to teasing her. 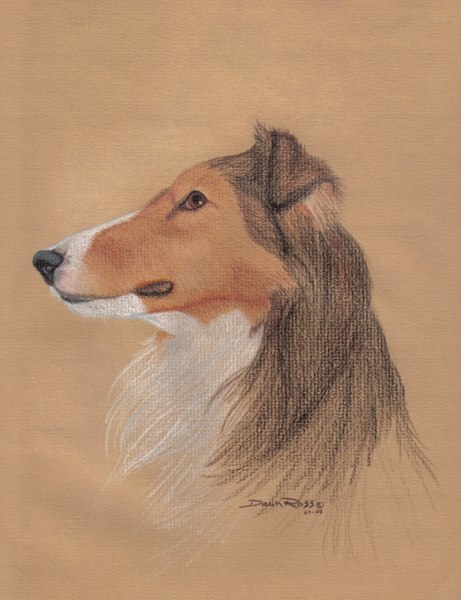 The above picture is dog art which I drew a few years after her death. A print of this dog art is available at http://www.naturebydawn.com/product/P-0001P. She died when she was thirteen years old and I was twenty three. I still think about her a lot and miss her very much. In Olar, South Carolina, Mollie, a German Short Haired Pointer, fell down a 33 foot abandoned well. Thankfully, Mollie was rescued by the local volunteer fire department. Mollie suffered no injuries, and the family, especially Olivia, their family’s 4 year old daughter, was extremely grateful. To see the touching video of Olivia and Mollie being reunited, click http://today.msnbc.msn.com/id/33393624/ns/today-today_pets_and_animals/ to visit the Today Show website. Okay, I heard this joke somewhere but I can’t remember where…. If a dog barks his head off in a forest and no human hears him, is he still a bad dog?